A simple black forest cake is a perfect treat on a hot summer day. 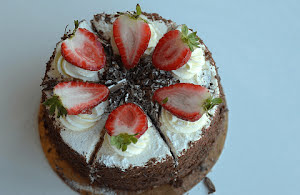 The following recipe is the simplified version of black forest cake you can easily make at home. Though a classic black forest cake includes a cherry filling, you can substitute it with your favorite berries or a fleshy fruit. You can double the quantities of ingredients if you want to make a bigger cake. If you're making it for the first time, reduce the number of layers to get it done easily. Fruity topping can also be experimented with and can be changed as per your preference. Let's collect our ingredients and make this moist, fruity and delicious black forest cake to delight our loved ones. If you try this one, do share your experience with all of us. Do try this simple black forest cake recipe made with fresh ingredients which are baked to perfection for a smooth and moist texture with an amazing flavor. Preheat oven at 170° C and flour about 8 to 10 inch greased cake tin with a waxed paper at the bottom. Boil 1/2 a cup of water and switch the flame to low. Add dark chocolate and cocoa powder in it. Switch off the flame instantly and gently mix till the chocolate is melted completely and is blended well with the cocoa powder. If required, you can add more boiled water. In a bowl, add eggs, 1-1/2 cup castor sugar, 1/2 cup brown sugar and 1/3 cup whipped cream. Whip briskly and beat for a few minutes till everything combines well. In a large bowl add flour, baking powder, baking soda, 1 tsp vanilla extract, 1/4 tsp salt, melted chocolate and cocoa powder (prepared in step 3), sugar/cream/egg mix (prepared in step 6) in it. Combine and beat the cake batter until everything is mixed well. Transfer the batter in the greased cake tin and gently pat to settle it down. Take out the cake from the tin and let it cool down to the room temperature. Meanwhile, combine red cherries, kirsch and a pinch of salt. Mash with a wooden spatula for about 2 to 3 minutes and keep aside. Combine heavy cream, powdered castor sugar and 1/3 tsp vanilla extract. Whip briskly till you get a smooth cream texture. Keep aside. And last but not the least, combine powdered chocolate cookies with crumbled dark chocolate. Keep aside. Cut the cake in half with a large cake knife from middle. Above the bottom part, make a layer of mashed cherries. Follow it with a layer of whipped heavy cream. Leave enough cream for the topping. Finally, put the other half of the cake on top. With a knife, settle the mixture of powdered cookies and dark chocolate on all the sides of the cake to hide the layered structure. Use the remaining heavy cream on top in your preferred way. Finish with garnishing of sliced strawberries. Refrigerate for about half an hour before serving.